Gold is considered a safe haven investment. It’s been around for thousands of years and is still held in large amounts from central banks across the globe and in this brief article we will explore different ways to invest in gold and also some of the best gold stocks. Gold is viewed as a hedge against inflation and its value strengthens against a weakening dollar. In addition, it has a negative correlation to the stock market, making it a solid investment for the purpose of diversification. Now, there are many ways you can gain exposure to the gold market. The first is buying physical bullion. However, most investors don’t really want to bother with trying to store their gold and keep it safe. Also, it’s not as easy to buy and sell as it is with a stock. You can also trade futures on gold through your broker. That said, margins are relatively high, not making it suitable for those who have small trading accounts. The easiest way to get exposure to gold is through the stock market. The SPDR Gold Shares ETF (GLD) tracks gold bullion, and is often the number one choice among hedge funds and investors seeking out the best gold stocks in the market. But if you’re looking for more action and the potential for greater return, your best bet is in individual gold-related stocks. 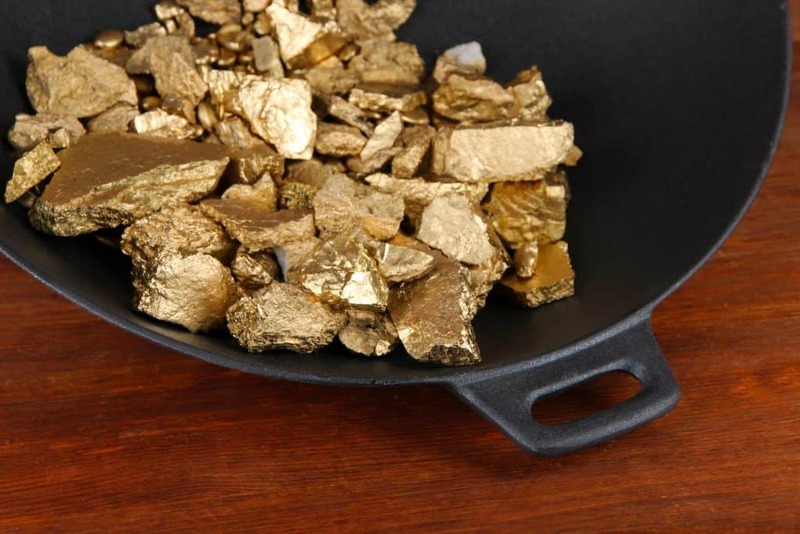 Now, there are different sub-categories when it comes to gold stocks, they include: miners, junior miners, and developmental-stage gold miners and there are even a few gold penny stocks just to name a few. Exploring, mining and extracting for gold is not cheap which is why you need to do your homework when selecting the best gold stocks. It takes time and money. That said, you want to look for firms that are well capitalized and not bleeding in debt. In addition, you want to avoid companies that do a majority of their business in politically unstable countries. Newmont Mining Corporation (NEM): With a market cap of nearly $20B, this US-based company acquires, develops, explores for, and produces gold. They are the only gold producer listed on the S&P 500 index. They have projects in four continents and five countries. Back in December of 2017, CEO Gary Goldberg, was inducted into the American Mining Hall of Fame. Newmont also offers its investors a dividend, making it an attractive play for income investors. Barrick Gold Corporation (ABX): Headquartered in Toronto, Canada, Barrick is one of the largest gold miners in the world. The company has projects in the United States, Canada, Australia, Argentina, Chile, Peru, the Dominican Republic, Papua New Guinea, Tanzania, Zambia, and Saudi Arabia. That said, more than 75% of the firms gold production comes from the Americas. At the end of 2016, Barrick had proven and probable gold reserves of 85.9M ounces. Barrick offers a dividend to investors and has a CEO who puts his money where his mouth is. CEO John L. Thornton owns more than 2M shares of the company in which 65% was purchased using his own personal funds. Franco-Nevada Corporation (FNV): Operates as a gold-focused royalty and stream company in the United States, Canada, Mexico, Peru, Chile, and Africa. As of March 21, 2017, it had a portfolio of 259 mineral assets and 80 oil and gas assets. What’s most impressive is that it has no debt and uses its free cash flow to expand portfolio and pay dividends. Shares of the stock have been on an impressive run over the last couple of years. This is a testament to their execution and being a truly cash flow business. When investing in gold stocks remember you are investing in a company. Whether gold is up, down, or flat, these companies may or may not move in the same direction. That said, you might able to find greater performance in individual gold names. For example, Franco-Nevada has outperformed the gold bullion etf over the last five years. Make sure to do your homework and understand that gold stocks will not always follow the price of gold.